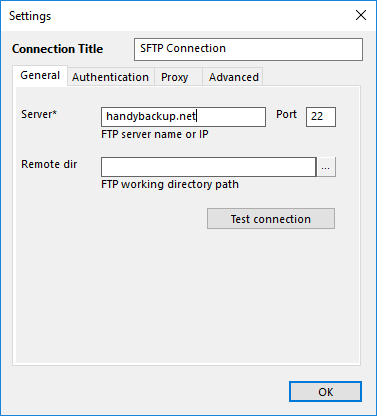 To use the plug-in in your backup, restore or synchronize tasks, you need to create SFTP configurations. Basically, each configuration contains parameters determining how to work with a remote server. Configuration dialog consists of four tabs: General, Authentication, Proxy and Advanced. 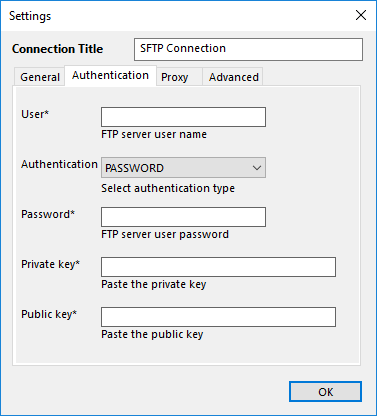 Under the General tab, you need to enter SFTP server address, and select a folder that the configuration will point to. Remote dir. By default, the configuration will provide access to a root folder provided by the SFTP server. If you want, you can change it to an inner folder: in this field, you can enter a path to an SFTP directory, or click the Select Folder button to browse for it. Click Test connection to test the connection. To enter login and password, go to the Authentication tab. 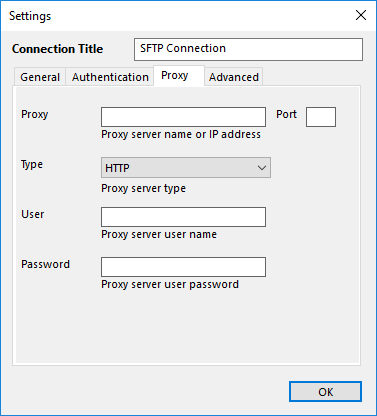 Under the Authentication tab, you need to specify how to connect to your SFTP server. Authentication. In this menu, you can select type of authentication: PASSWORD or PUBLIC_KEY. After specifying authorization parameters, you can check connection under the General tab. Under the Proxy tab, you can specify proxy settings. These settings override general proxy settings of the program (see Proxy Settings for more details). If you are behind a proxy server that doesn’t require authorization, leave User and Password empty. Under the Advanced tab you can change some advanced specifics of the plug-in’s work. For most SFTP servers, default settings should work well, but there are situations when you may want to change them. Use absolute paths for FTP commands. 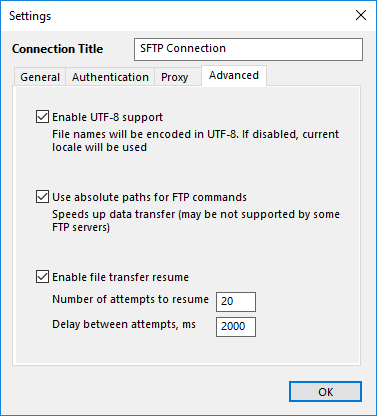 If changing SFTP folders doesn’t seem to work correctly, uncheck this box. You can read about general concept of configurations in Plug-in Configurations.